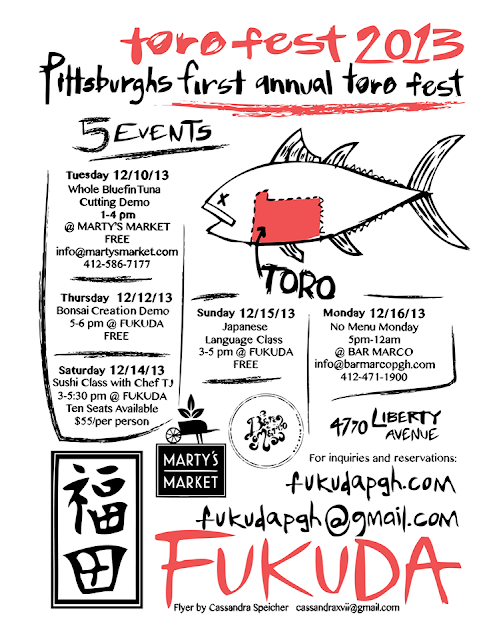 PennsylvAsia: Fukuda's Toro Fest 2013, December 10 - 16. Whole Bluefin Tuna cutting demo, Bonsai creation demo, Japanese language and culture class, Sushi making sessions, and delectable fish will be flown in from all over the world with an exquisite menu never before seen in Pittsburgh during the festivities only at Fukuda. The toro in this festival's name refers to specific part of a blue fin tuna, again depicted on the flyer. Fukuda is located at 4770 Liberty Ave. (map).